John Martin has taken the Hot Wheels™ Car Care Products Porsche 911 GT3-R to a fighting third place in the third Australian GT Championship in deplorable conditions at the Formula 1 Rolex Australian Grand Prix. Heavy rain descended on Melbourne this morning just ahead of the 12pm race. Standing water forced the race to start under Safety Car and once the green flag flew, the battle was on. 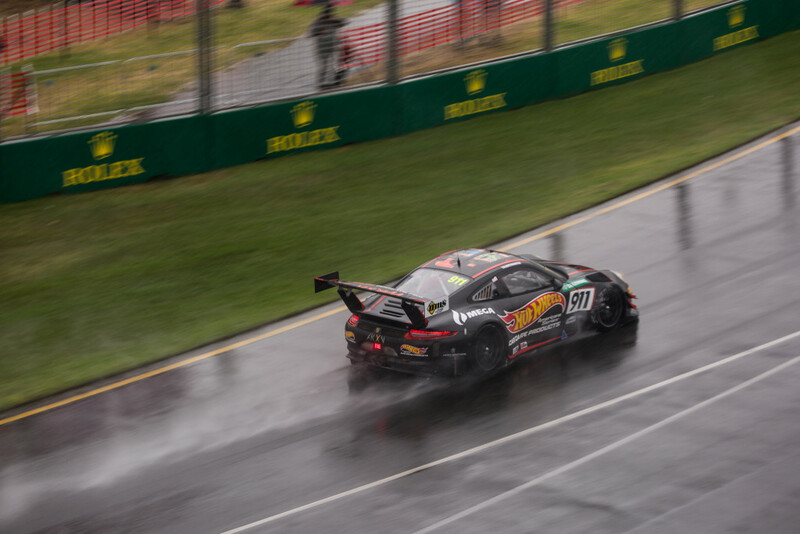 Martin reported limited visibility from inside the Walkinshaw GT3-prepared Porsche however pressed on in fourth place. Then, an opportunity presented itself to get into third position. Martin executed a superb pass on 2005 Formula 1 Australian Grand Prix winner, Giancarlo Fisichella and proceeded to drive away. Soon after – when the LMP2 Le Mans 24 Hour pole-sitter was beginning to feel comfortable with the balance of the Hot Wheels™ Car Care Products machine – the Safety Car was triggered for an incident at the back side of the race circuit. Due to time certainty, the race was declared with Martin scoring another solid swag of points towards the Hot Wheels™ Car Care Products Australian GT Championship campaign. The first round of the Australian GT Championship will come to a close tomorrow with Talbot taking to the wheel for the 12pm start time, where he will start in sixth position. “It was quite a short race in the end an unfortunate that it ended when it did, as we were really finding our stride. “The conditions were wild out there. With the track only used once a year and there being so many painted lines – particularly on the carpark area on the back side of the circuit – it was unbelievable. “It is a credit to everyone in the Australian GT field that there weren’t any more cars off the track, everyone drove well. “It is a nice feather in the cap, but he’s really just another car to pass! I think he was struggling with his tyres or something.